Whether you’re a nature photographer or simply an animal lover, winter is a great time to spot wildlife in county parks. With the leaves down, birds and animals are easier to see, and some migrating species only call Fairfax County home during the winter season. We’ve gathered tips from a few park and recreation sites across the county on what fantastic beasts you might see and where to find them. Green Spring Gardens suggests a circuit hike that may include animal sightings on land, in the air and in the water. Keep reading for some other good wildlife spots. In the winter, you can spot many types of wildlife at Green Spring Gardens if you walk in a circle from the parking lot, past the Horticulture Center to the children’s gardens behind the building, down the hill into the woods, past the ponds, and back up the hill towards the Historic House. Walking near the grassy field between the parking lot and the Green Spring Horticulture Center, you may see Canada geese nibbling on the grass. Looking into the sky above the grassy field, you may spot black vultures riding the thermals. Listen for hawks calling, and you may spot a red-tailed hawk soaring above the field looking for a meal. White-throated sparrows love to call from the thick bushes alongside the back of the white gazebo. Chickadees and Carolina wrens can be found in the smaller bushes and trees near the entrance of the Horticulture Center. Behind the center, you may spot mockingbirds eating holly berries in the Children’s Garden. In the Discovery Garden, listen for screaming blue jays that love to hang out in the cedar trees by the picnic tables. Gray squirrels love to scamper along the fence behind the picnic tables, and you will often see signs of their lunch on the stumps nearby — walnut shells and broken pinecones. Walking down the Virginia Native Plant Trail into the woods, you may see a white-tailed deer browsing low-lying shrubs. Without leaves on the trees, you can spot squirrels jumping from branch to branch near their dreys high in the oak trees. You may see nuthatches moving head first down the trunk of a tulip tree or hairy or downy woodpeckers pecking at the smaller trunks of maple trees. If you are lucky and are there at dawn or dusk, you may catch a glimpse of one of the local foxes. As you cross the bridge, peer into Turkeycock Run and you often will see Northern cardinals bathing in the stream. After you cross the bridge, close to the wooden boardwalk there are many dead trees, perfect for a variety of woodpeckers looking for an insect. The huge oak logs also are a good place to spot squirrels eating a meal of acorns. As you walk along the boardwalk toward the ponds, look for the occasional red fox in the woods. At the ponds, you probably will see Canada geese, mallard ducks, and maybe a lone great blue heron. If it’s a warmer winter day, you may spot a turtle on the side of the pond sunning or bluegills swimming near the pond surface. If you see and hear crows cawing, they are probably mad at a Cooper’s hawk, who might have a nest near the sycamore tree. Look in the mud along the pond to see the footprints of raccoons and deer. As you head up the hill toward the parking lot and the Historic House, there are usually squirrels and blue jays foraging on the ground near the willow oak in front of the house as well as sparrows, chickadees and wrens higher up in the branches of trees closer to the parking lot. See birds you won’t find at other times of the year at Burke Lake during the winter waterfowl migration. As temperatures dipped, staff spotted ring-necked ducks, bufflehead, hooded mergansers, ruddy ducks and horned grebes. As colder temperatures cause waterways to freeze in the North, park personnel expect to see an increase in the diversity of species as well as an increase in their numbers. As always, Burke Lake Park is also an excellent place to spot and photograph bald eagles. The meadow behind Frying Pan Farm Park’s indoor arena and the service road behind it, including the adjoining woods, are usually the park’s best wildlife viewing spots. There have been deer, foxes, squirrels, hawks, and other birds in the meadow and surrounding trees. Even some wild turkeys one time. Look for deer, foxes and turkeys while strolling the nature trail and around the trailer parking lot. You might see deer and foxes around the corn field and foxes around the run-in shed for the cattle. A hawk has hung around the trees by the small water jump, along with crows. The crows pop up all over. There are often mallards or Canada geese in the water catchment basin near the northeast edge of the park and cardinals in the trees along the service road between the intersection and Monroe Street. You also can find birds around the Indoor Arena or along the service road from the Visitors Center to the farm. They may not be wild, but don’t miss seeing the farm animals, too. There are a few spots on the trail at Hidden Oaks that can be great for photo ops and wildlife viewing. At the first red bridge as you go down the Old Oak Trail from the nature center, there’s a creek where families often stop for a look. Occasionally, you may spot a deer or turtle down by the creek. Behind the nature center is Nature Playce and a pond which are good for black squirrel sightings and frogs in the spring/summer. Stroll the Huntley Meadows boardwalk through the park wetlands to spot winter waterfowl such as gadwalls, shovelers, pintails, hooded mergansers, ruddy ducks, canvasbacks and others. In November 2018, staff spotted a merlin and a sora hanging around in the wetland. Capture beautiful landscape views and lighting in winter, too. Lake Accotink has nearly 500 acres of green space, and there are lots of different animals to be seen. There are great locations along the Cross County Trail and the Lake Accotink Trail, which connect to make a four-mile loop trail around the lake and along Accotink Creek. With the leaves down, hikers along the south side of the lake are likely to see the large bald eagle nest and the breeding pair that live in it. Great blue herons, osprey, and cormorants can be found in and along the edges of the lake. Deer and fox are plentiful throughout the park. Be careful along the main entrance road in the evenings. All along the lake, and especially near the marina, geese and ducks are plentiful. Beaver might be spotted upstream along Accotink Creek. Owls like to hunt in the large open field off of the Heming Road entrance near the McLaren-Sargent Pavilion. Pinecrest Golf Course is an Audubon International-sanctioned course and has lots of birds that frequent it, such as this mallard duck. The Potomac River attracts a variety of winter waterfowl, and Riverbend Park is a great place for winter birdwatching. Look for flocks of Buffleheads, mergansers, grebes, ring neck ducks, coots, black ducks and swans. To learn more about what you’re seeing, consider registering for one of the park’s Winter Waterfowl Hikes. In January, there are wonderful birding opportunities for photographers along the power lines on the eastern edge of Sully Historic Site. There is a small trail there, less than a half-mile, that provides viewing opportunities. Wildlife edge habitat include bluebirds, cedar wax wings, red- shouldered hawks, Cooper’s hawks, raven, deer, red fox, squirrels and chipmunks. This entry was posted in Uncategorized on January 11, 2019 by Fairfax County Park Authority. Despite the frigid temperatures, visitors ventured into county parks on January 1 to take part in the First Hike photo contest. The Park Authority got the New Year off to a healthy start with its Healthy Strides calendar and monthly tips to help everyone work on better eating, more physical activity and more sleep. Park acreage grew with the acquisition of eight acres of land near Loisdale Park. The FCPA announced that outdated lighting on the basketball court at South District Park would be replaced with new energy-efficient lighting to benefit the environment, save money and make basketball players happy. Park Board members got ready for the year ahead by electing officers for 2018. In February, camp registration opened for more than 1,900 FCPA summer camps. The Park Board voted to rename Athletic Field 5 at South Run Regional Park in honor of Jack Nolan, a longtime leader and supporter of youth soccer in the Springfield District. The Park Authority spread the word that Backlick Park, Griffith Park, Lisle Park and Wakefield Park would be getting updated playgrounds thanks to the Playground Replacement Project, and work was scheduled to begin on the Dead Run Stream Restoration project. Audrey Moore RECenter helped parents and kids decide on the perfect summer camp by providing fun activities and one-stop shopping at Camp Fair. The Park Board approved a new Cultural Resource Management Plan, and Dr. Abena Aidoo was appointed to the Park Board, filling the at-large vacancy left by the retiring Walter Alcorn. A call went out for volunteers to help with the Invasive Management Area’s Take Back the Forest effort in April and May, and staff members were encouraged to honor amazing volunteers with nominations for the annual Elly Doyle awards. Burke Lake Park welcomed spring with the three-day Baskets and Bunnies event, and March 30 marked the application deadline for paid internships at Sully Historic Site through the Margaret C. Peck Youth Internship program. A public information meeting was held to discuss using historic Ash Grove house as a Resident Curator Property, and fans of Clemyjontri Park were asked to “pardon our dust” as work was scheduled to begin on a parking lot addition. Construction work also was scheduled on Marina Road at Burke Lake Park and on the conversion of Field 4 in Nottoway Park into a multi-sports field. Mastenbrook Grants were awarded to fund new features at Our Special Harbor sprayground and for improvements on diamond fields 1 and 2 at Fred Crabtree Park. The newly-completed Lee District Family Recreation Area was honored with an award from the National Association of County Park and Recreation Officials in the Park & Recreation Facility category, and Jean and Ric Edelman were honored with an Outstanding Contributor Award for their support of Observatory Park at The Turner Farm. A ceremony was held to rename Athletic Field 5 at South Run District Park in honor of Jack Nolan. Restoration work began on a highly degraded stream in Long Branch Falls Park, on Phase 1 construction at Monticello Park, and on a new indoor practice facility at Pinecrest Golf Course. A community meeting was held to discuss options for the future of Lake Accotink Park, and an open house was held at Ash Grove House as applications were being accepted for a resident curator. In May, the new RecDynamics registration system for park programs was launched, and a bell rang at the Government Center to mark the official opening of the 2018 Government Center Farmers Market. More than two dozen children recited the oath of citizenship at the Children’s Naturalization Ceremony at Sully Historic Site. Adventurers set out on the 2018 Discovery Trail, a ribbon-cutting ceremony was held for the new playground at Bucknell Manor Park, and new features were added to Our Special Harbor sprayground. The Park Authority sought public comment on its new Strategic Plan for Fiscal Years 2019-2023, a community information meeting was held on plans to renovate and expand Mount Vernon RECenter, and residents were invited to a meeting on use of the historic Lahey Lost Valley house as a Resident Curator property. The Park Authority received a Certificate of Achievement for Excellence in Financial Reporting by the Government Finance Officers Association for its 2017 Fiscal Year Comprehensive Annual Financial Report. The Board of Supervisors named James P. Zook to fill the vacant at-large seat on the Park Board. Parkland grew by more than 20 acres thanks to land transfers in the Lee and Mount Vernon districts. Little Leaguers received Mastenbrook grants for improvements at Pine Ridge Park and Reston North Park, and Pimmit Run Trail was impacted by work on a pedestrian bridge replacement. As the month came to a close, members of the military and their families enjoyed a free admission day at park facilities in observation of Memorial Day. June brought a new beginning to the Park Authority as the Board approved a Strategic Plan for Fiscal Years 2019-2023. Visitors from the Commission for Accreditation of Park and Recreation Agencies (CAPRA) spent a few whirlwind days at the agency reviewing documents, taking tours and meeting with staff as they prepared recommendations on FCPA accreditation. After years of work, the Lee District Family Recreation Area marked completion with a ribbon-cutting ceremony for Chessie’s Trail. A ribbon-cutting also was held for the new Hidden Pond Nature Center playground. Anglers were invited to fish for free at the beginning of the month as part of the state’s Free Fishing Days program, and a state study found that the fish community looks good at Lake Fairfax. Toes were tapping as the Summer Entertainment Series began, and a new Springfield Nights concert series was added at Burke Lake Park. Dads were treated to the 45th Annual Antique Car Show on Father’s Day at Sully Historic Site, and the Fairfax County Farmers Markets celebrated Bike to Market Week at select locations in collaboration with the county’s transportation department. June was filled with community outreach events, too. A public meeting was held on updates to the park Alcohol Policy. The RECenter sustainability study was presented at a public meeting, and community members were invited to review a draft of the Lake Fairfax Park Master Plan Revision. Public meetings were also held to discuss proposed improvements at Rocky Run Stream Valley and a Sustainable Trail Plan for Mount Vernon District Park. Patrons got a chance to Go Ape a little longer as the park facility extended its nighttime hours. In addition, it was a time for honors. The Park Authority received eight awards from the National Association of Government Communicators for writing, publications and promotional work, and the Beatrix Farrand Landscape at Green Spring Gardens was added to the Historic American Landscapes Survey at the Library of Congress. Staff briefed the Park Board on achievements under the Natural Resource Management Plan. Board members approved Mastenbrook grants to install new fencing at Poplar Tree Park, help restore a meadow at Marie Butler Leven Preserve and purchase equestrian jumps at Frying Pan Farm Park. Work began on the Bull Neck Run Stream Restoration and on a new access road at Ellanor C. Lawrence Park. As the month closed, residents were invited to celebrate July 4th a little early with fireworks at Lake Fairfax Park. In July, the Washington Nationals’ Bryce Harper cut the ribbon and threw the first pitch at the new All-Star Complex bearing his name at Fred Crabtree Park. A ribbon-cutting ceremony was held for the new trackless train and picnic area at Clemyjontri Park, too. The Park Authority announced that Hidden Oaks Visitor Center Manager Suzanne Holland was named a Shining Star of Interpretation by the National Association for Interpretation. Construction work began on the Idylwood Park parking lot and on the Pohick Stream Valley Trail, and renovations got underway at Oak Marr Golf Complex’s driving range. The Park Board made paddlers happy by approving Mastenbrook grants to fund the purchase of new canoes at Riverbend Park. Staff and volunteers won kudos in August. The American Alliance of Museums accredited the Resource Management Division’s Historic Artifacts Collection, Colvin Run Mill, Sully Historic Site, Green Spring Gardens and Frying Pan Farm Park for their commitment to excellence. Volunteer excellence was recognized when the Elly Doyle award winners were announced. Frying Pan Farm Park played host to the 70th Annual Fairfax County 4-H Fair and Carnival, and there was a blast from the past as drive-in movies returned to the Starlight Drive-in Cinema in Centreville. Sully Historic Site was forced to quit building fires in its 18th century kitchen when chimney swifts decided to make the building’s chimney a temporary home. Construction work began on the Wilton Woods playground, and the county sprayed for mosquitoes at two parks to reduce the risk of West Nile Virus. September was celebration time as the Park Authority earned reaccreditation by the Commission for Accreditation of Park and Recreation Agencies. It once again met all 151 national standards to earn the designation. The new Valis Family Golf Learning Center opened at Pinecrest Golf Course, and a ribbon-cutting was held at the new Griffith Park playground. Riverbend Park hosted the annual Virginia Indian Festival, and Frying Pan Farm Park provided refuge for nine horses affected by Hurricane Florence. A ribbon-cutting was held at the new multi-sport field at Nottoway Park, trail maintenance began at Sugarland Run Stream Valley Park, and stream restoration work began at Indian Run Stream Valley Park. The Park Authority joined with Bike Fairfax to welcome cyclists to the Gerry Connolly Cross County Trail as part of National Bike Your Park Day festivities, and it joined with the Northern Virginia Regional Park Authority to hold a public meeting on new rules governing the use of drones in parks. An open house was held at Lahey Lost Valley as the search continued for a resident curator. The Park Board approved a new Alcohol Policy for the parks and changes to the Mount Vernon District Park Master Plan. The Park Authority honored its own in October with the annual Trailblazer awards. Oak Marr’s newly renovated driving range opened to the public. Park sites marked National Lands Day with activities such as the cleanups at Scott’s Run and Ellanor C. Lawrence Park. The Ghost Train pulled out of the station at Burke Lake Park, Sully Historic Site hosted Historic All Hallows Eve festivities, and folks had a spook-tacular time at Lake Accotink Park’s annual Fall Festival. The agency celebrated Archaeology Month with a month-long social media campaign to raise awareness of archaeology in the county, and trout season opened at Lake Fairfax. A cow that decided to make a break from its new home at Frying Pan Farm became a social media star. An open house was held at Ellmore Farmhouse as the resident curator application period opened, and applications were being taken for resident curator for the Lahey Lost Valley property. The Park Authority hosted a public hearing on a proposed exchange of property in the Mason District, and Park Board members approved Mastenbrook grants to help control invasive plants in the Turkeycock Run Stream Valley and to install scoreboards at Clermont Park. The award-winning year for the Park Authority continued into November. The agency garnered three statewide awards for excellence from the Virginia Recreation and Park Society, including honors for Chessie’s Trail. It was honored with a Best of Aquatics 2018 Programming Award from Aquatics International for excellence and innovation in aquatics programs and facilities for its Virginia Swims program. The agency also honored its outstanding volunteers and supporters at the annual Elly Doyle Park Service Awards ceremony. A ribbon was cut on the new playground and off-leash dog park at Monticello Park, and Backlick Park officially reopened after major renovations. A bench was dedicated at Huntley Meadows Park in honor of late Park Director William “Bill” Beckner, and a lease-signing ceremony was held for the new resident curator for Turner Farmhouse. Trail improvements began on a section of the Gerry Connolly Cross County Trail, and work got underway on the Sugarland Run Stream Valley Maintenance Project. The Park Board approved Mastenbrook grants to develop community garden plots at Bruin Park, install fencing on field 6 at Pine Ridge Park and purchase a portable ADA compliant mounting ramp for Frying Pan’s equestrian area. The Park Authority expressed its thanks to service members and their families by offering free admission to park facilities in honor of Veterans Day. As Thanksgiving approached, the agency encouraged county residents to head to a park and Opt Outside on Black Friday, instead of heading to a mall. Audrey Moore RECenter kicked off the month of December by playing host to the 41st Annual Holiday Arts and Crafts Show, and Green Spring Gardens held its annual Gardener’s Holiday Open House and Puppet Show. Burke Lake Park welcomed visitors to its Winter Wonderland and new Celebration Station, and visitors rode through festive holiday lights on the Starlight Express at Lake Fairfax. Sully Historic Site hosted special candlelight tours, and Santa was spotted at parks throughout the county. This entry was posted in Uncategorized on December 28, 2018 by Fairfax County Park Authority. It’s original name was the Wakefield Park RECenter. Former Annandale Supervisor Audrey Moore played a major role in the park’s creation, and in 2002 the RECenter was named in her honor. Moore died peaceably at her home Dec. 12, 2018, at age 89. (Legacy.com: https://www.dignitymemorial.com/obituaries/springfield-va/audrey-moore-8085786 ) A Celebration of Life gathering was held at Demaine Funeral Home on December 22, 2018. Contributions in Audrey’s memory may be made to Friends of Accotink Creek, http://www.accotink.org/. The Washington Post considered Moore a political maverick in the days she served the county. She was elected to the Annandale District Supervisor position in 1971 and served in that post for 16 years. She was a slow-growth proponent, battling developers and, sometimes, other supervisors. The board underwent a major change in 1987 when three supervisors were replaced in November elections by candidates promoting a slower growth rate for the county after it had seen rapid development. Moore was elected chairman, defeating three-term incumbent Republican John F. Herrity, for whom the Herrity Building in the Fairfax County Government Center complex is named. That pivotal election swung control of the board from a 5-to-4 Republican majority to a 7-to-2 Democratic majority. The $850,000 campaign for chairman set a record at the time for being Northern Virginia’s most expensive local election. The Washington Post reported that the vote was seen “as a referendum on the county’s future and a popular endorsement of Moore’s campaign theme that transportation and development policies need to be balanced.” The population of Fairfax County, currently more than 1.1 million, had increased from 596,901 in 1980 to 704,757 in 1987. Moore’s concern about overdevelopment stemmed from a childhood spent in suburban New York City where she watched buildings take over open spaces and add to pollution problems. While voters were initially drawn to her slow-growth approach, she was defeated for the Board chairmanship during a recession in 1991. In 2002, Moore was honored for her county service when Fairfax County renamed Annandale’s Wakefield Park RECenter in her honor. Moore had said it was her involvement in the creation of Wakefield Park that spurred her interested in the slow-growth movement. Despite its role in protecting the capital from Confederate attack during the Civil War, lately Fort Willard has been unable to protect itself from a different sort of invasion: invasive overgrowth. After the unexpected Confederate victory at the Battle of Manassas in July 1861, concern for the safety of the District of Columbia and Alexandria prompted plans for a complete fortification system for Washington. Construction began immediately, and there were 60 forts and 93 batteries protecting the city by the end of 1863. Greater emphasis was placed on the southern forts because they were believed to be in more danger of attack. Fort Willard, the southernmost fortification in the Defenses of Washington, is located on a high point of a ridge overlooking low ground along the Potomac River. It commands a clear view to present day Fort Hunt Road and beyond. Constructed at the end of 1862 as Redoubt “D” to Fort Lyon by detachments of the 34th Massachusetts Infantry, it was later named in honor of Colonel George L. Willard, who was killed at Gettysburg on July 2, 1863. After the Civil War, the site most likely lay fallow for many years. In the 1930s, development of the Belle Haven subdivision began, and the fort site was preserved in an area that eventually became Fort Willard Circle. Today you can still see the earthen fortifications, cannon embrasures or platforms, and the remains of a bombproof (bomb shelter) and magazine (arms and gunpowder storage) area. The relative isolation of this site within a quiet residential neighborhood has allowed for the archaeological and cultural features at Fort Willard Historic Site to remain relatively undisturbed and subject only to the natural processes of erosion and tree growth. This overgrowth did not intimidate the members of the Young Men’s Service League (YMSL) of Vienna-Oakton, a volunteer organization comprised of mothers and their high school-aged sons with a mission to serve the community and develop leadership skills. One hundred and fourteen members, divided into morning and afternoon shifts, volunteered a Saturday to refresh Fort Willard Park. The group completed three assigned projects — regrading and extending the park’s perimeter path, removing overgrowth from the perimeter fence, and cleaning the community’s brick gathering areas. The perimeter path, only present on the southeast half of the circle, lost much of its gravel and stone dust over the years and was in need of a fresh layer. The goal also was to extend the path through an area typically plagued with mud and standing water. Following a full day of work regrading and extending the perimeter path, neighbors and visitors now can navigate the entire border of the Civil War fort without encountering mud and flooded areas. Perimeter path before and after. The perimeter fence was overrun by wisteria, English ivy, Virginia creeper, pokeweed and thorny brambles. Moss dominated the brick gathering spaces. Clearing the overgrowth along the fence line allowed for a better view of the earthworks, and the clean brick plaza areas will make wonderful backdrops for community gatherings. Brick area and perimeter path before and after. Project leaders included nine Park Authority staff and three members of the Belle Haven Citizen’s Association. During the lunch break, David Buchta and Elizabeth Crowell of the Park Authority spoke to the volunteers about the historical and archaeological significance of Fort Willard. The Vienna-Oakton Chapter of the Young Men’s Service League. The Young Men’s Service League provides young men with important skills and experiences to guide their futures and creates an environment for mothers and their sons to bond. The Park Authority was fortunate to encounter this organization, and Fort Willard’s efforts offer an example of enhancing stewardship of the county’s cultural resources on parkland. Author Margaret Publisi Canilang is a Heritage Resource Technician for the Fairfax County Park Authority’s Resource Management Division. This entry was posted in Uncategorized on November 30, 2018 by Fairfax County Park Authority. Scouts are invaluable to parks. Scouts often volunteer in parks to upgrade trails, plant native trees, remove invasive plants, and take on an endless stream of other important tasks. Some even see a need and develop their own ideas to fulfill Gold Award and Eagle Scout requirements in cooperative ventures. This story begins in May 2008, when an Eagle Scout undertook a project to create a natural screen between a ballfield at South Run and 50 new houses being built near the park. The goal was to turn a manicured lawn back into a more environmentally appropriate natural state by planting 250 native trees in it. As time passed, the native tree area was overrun by invasive plants, in particular, Japanese honeysuckle that killed big trees bordering the ballfield and was about to kill the newly planted trees. Porcelain berry, multiflora rose and autumn and Russian Olive were also targeted. Ten years later, Boy Scout John Reistrup led a May 2018 assault on those invasive plants at South Run. Reistrup’s team filled three tightly packed dumpsters with the honeysuckle they removed. His project made a big dent in the invasives but didn’t come close to eliminating the problem. Alan Brown of Springfield, Va., and Troop 1849 in the Old Dominion District recently became another of those industrious scouts partnering with parks. He proposed a Hornaday Eagle project at the same South Run area. Hornaday Eagle is similar to a regular Eagle project, but it requires the scout to have five or six ecological merit badges and to conduct a project related to stewardship of the land that includes six months of follow-up. Brown started by creating a GPS-based grid in order to conduct a plant survey of the area. That required the difficult task of cutting paths into dense tangles of thorns and vines. Seventeen people joined him to conduct the botanical survey. He recorded GPS coordinates for each corner in the grid and marked the spots on the ground. Lauer used the grid to assign other scouts to the cleanup area. Brown had the scouts use different protocols for clearing the invasives and tracked which system worked best. He led a crew of more than two dozen people who cleared four areas in mid-October. Brown’s colleague Jake Hecker oversaw removals in two other areas, and Mason Melear, another of Brown’s crew, led clearing of two more. In late October, Brad Harris led a corporate group from Appian targeting another area and concentrating on the critical removal of invasive root structures. It is plain to see this fight to save trees is a tough one, and scouts are making progress saving the forests for future generations. Author Kurt Lauer is the volunteer manager at South Run RECenter. This entry was posted in Uncategorized on November 28, 2018 by Fairfax County Park Authority. So, when was the last time you saw a cow running down Route 28 near Herndon? There are plenty of places in the United States where cows near roads are common, and in some you may even have to wait for a herd to cross the road. Fairfax County is not one of those places. However, on Monday, October 29, 2018, a few folks driving on Route 28 saw, literally, a four-on-the-floor bovine running down the four-lane divided highway. The incident is an unusual, if not unique, example of the trials of managing a 1920’s-era farm park in a county with more than a million people. The cow tale started a few days earlier when staff from Frying Pan Farm Park, including longtime volunteer and summer farmhand Kayla Blatman, attended a livestock auction at Virginia Tech on October 26. The Friends of Frying Pan Farm Park had raised funds for Blatman, who is a student at Tech, to attend the auction and make a purchase. The park crew bought a heifer, named Hokie after the school’s mascot, and a sheep, named Lane after the school’s football stadium. The crew and animals completed their milk run back to Frying Pan on Saturday and, as is routine when new animals are brought to a farm, Hokie and Lane were placed in quarantine. The plan was to keep them quarantined for a couple of weeks to assure there were no health issues. This was the heifer’s first time isolated from other cows, and she had been agitated after all the changes she’d undergone. Open range must have sounded like a good idea. During her stall cleaning that fateful day, the black Angus was placed in a barn hallway that was blocked at the end by a tractor wagon that stood about three and a-half feet tall. Guess how high an agitated cow can jump. Site Manager Yvonne Johnson said that Farm Manager Paul Nicholson told her, “The moment that cow’s hooves hit West Ox Road I was on the phone to the police.” Nicholson knows there aren’t many ways to stop a thousand pounds of running muscle that doesn’t want to stop. Police and firefighters were on the scene quickly and escorted the heifer which, for a while, was free to go wherever it wanted to lead the trailing officials. Hokie ran out the main entrance of Frying Pan Farm Park and turned right onto the rather appropriately-named West Ox Road. She took another right at Centreville Road and crossed Frying Pan Branch creek before taking a left on Frying Pan Road. Police and fire personnel tried to corner her there, but the road wasn’t conducive to rustling a running cow. Road crews hadn’t built the road and its shoulders with that sort of thing in mind. Hokie rambled along Frying Pan Road to Sully Road/Route 28, where she took another right and headed north to continue her Farmville run up the Dulles tech corridor. Along that stretch, officials tried to funnel her into a trap, but Hokie kept slipping past roadblocks. Eventually she took a wrong turn and headed the wrong way up an entrance ramp, where a couple of nearby good Samaritans who had joined the pursing ‘cownga’ line managed to get their vehicles ahead of and behind her to trap her against a safety wall. Frying Pan staff placed their animal transport vehicle at the only opening in the makeshift enclosure, and Hokie had nowhere to go but into the truck. Her one-hour, two and a-half mile escape run was over. The evasive cow was returned to quarantine and has been closely monitored to make sure she’s okay after her breakout. This time, there is another cow nearby to supply familiar smells and sounds. And security has been beefed up. Although we wrote this blog with a light-hearted touch, be assured the Park Authority and local officials took the situation quite seriously as it played out. Police and fire officials were notified immediately, and steps were taken to protect both the public and the cow while the heifer was on the run. Author David Ochs is the Manager of Stewardship Communications for the Resource Management Division of the Fairfax County Park Authority. This entry was posted in Uncategorized on November 5, 2018 by Fairfax County Park Authority. If there’s anything more breathtaking than the colors of fall, it’s the mirror-image reflection of forest over a tranquil lake. Brilliant specks of orange, greens bursting into gold, and majestic reds, all outlined by a crystal-clear fall sky, ripple gently in a scene so soothing it’s almost rejuvenating. At this time of year, Burke Lake Park is a haven from the fast pace and constant connectedness of today’s world. It’s time to dress for the weather, unplug for 30 minutes and immerse your senses in nature’s beauty. Soak in small things that you may not notice at other times of the year, like the bursting crimson capsules of the strawberry bush, also known as hearts-a-burstin’, as its warty red fruits split open in fall to reveal smooth, bright red seeds. Usually a spindly shrub with an inconspicuous flower, it comes into its own at this time of year with its splashy display. Stop and listen. You may hear the territorial drumming of woodpeckers, a tap-tapping as they probe bark for insects and larva. If you stay still for a minute, you might be rewarded with a view of the strikingly attractive pileated woodpecker. This large bird can be almost 20 inches in size and has distinctive zebra-like markings and a peaked red crest. It’s a memorable sight. Maybe you’ll see the tiny downy woodpecker, with its unique checkered black and white markings and acrobatic movements, as it hitches around tree trunks foraging for insects. Woodpeckers nest in cavities in the dead trees in the park or in dead tree limbs, a testament to leaving dead trees, known as snags, where they stand on both parkland or private property if they don’t pose a threat. There’s lots to take in along the lakeside trail. It’s a 4.7-mile loop around the lake if you decide to complete the entire trail; it’s not hilly, and it’s pleasantly shaded with canopy. The park also hosts lots of other ways to enjoy nature. There are children’s playgrounds, boat rentals and fishing, pavilions, a disc golf course, mini-golf, a carousel, a mini-train ride and camping facilities, all in a peaceful woodland setting. Check Burke Lake’s website for hours and dates as times vary seasonally. So take a relaxing stroll and enjoy the fresh fall air. Pick up a paddle, or just pull up on a park bench and soak in the beauty of Northern Virginia. Unplug for a while in a calm setting, and reconnect with nature through its showy fall splendor. Burke Lake Park is at 7315 Ox Road in Fairfax Station, Va. 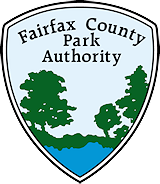 The Fairfax County Park Authority also offers similar waterfront experiences at Lake Fairfax Park in Reston, Lake Accotink Park in Springfield, Riverbend Park in Great Falls, and several small lake parks. Author Beverley Rivera is a Fairfax Master Naturalist. This entry was posted in Uncategorized on October 31, 2018 by Fairfax County Park Authority.